After many successful tests of our devices, we were convinced that Japanese beetles are no match for BugVibes™! However, to prove the high level of effectiveness in preventing beetle damage to plants, we decided to run it by the pros. It turned out the pros were right in our back yard at the University of Wisconsin, Madison department of Entomology. Well known for their Nutrient and Pest Management (NPM), Integrated Pest and Crop Management (IPCM) program, and Integrated Pest Management Program (IPM), the University of Wisconsin helps create and deliver innovative, cost effective and timely outreach solutions, and addresses critical issues regarding pest management, pesticide use, and nutrient management by Wisconsin farmers and landowners. As experts on Japanese beetles, they were enthused to test out a new form of pest control, perfect for organic growth with no additions of pesticides, spraying (of any kind), trapping, etc. We gladly handed over BugVibes™ to Professor Chris Williamson, a well known expert in methods for fighting Japanese beetles for consumers and commercial endeavors. 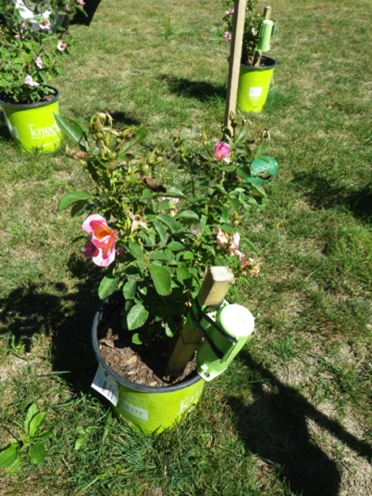 Having delivered many lectures and articles concerning the failure of current methods such as Japanese beetle traps in protecting plants, Chris composed a rigorous test consisting of twelve Knockout roses. Six contained a rose plant with a BugVibes™ unit attached and six had the same type of rose plant, without any BugVibes™ units. To attract a high population of Japanese beetles, beetle pheromone and floral scents were placed amongst the rose plants attracting scores of beetles to the roses. Roses were then grown according to the label directions. Plant health was monitored through a 30 day period corresponding with the peak activity of the beetles. After 30 days, roses without BugVibes™ were riddled with foliar beetle damage — over approximately 1/3 of the leaves were damaged. Roses with BugVibes™ fared much better. These roses had very little foliar damage! The amazing results offer scientific evidence proving the ability of BugVibes™ in preventing beetle damage.